Kellie and I go back. Waaaaaay back. Like, she was on drill team with my sister in their 8th grade year and we cheered together my freshman year and her senior year back. We reconnected on Facebook a few years ago and it has been awesome to watch her family grow. She and Ron are welcoming their 4th baby together next month and Ron has two kids as well. Such a fun, big family- I love it! 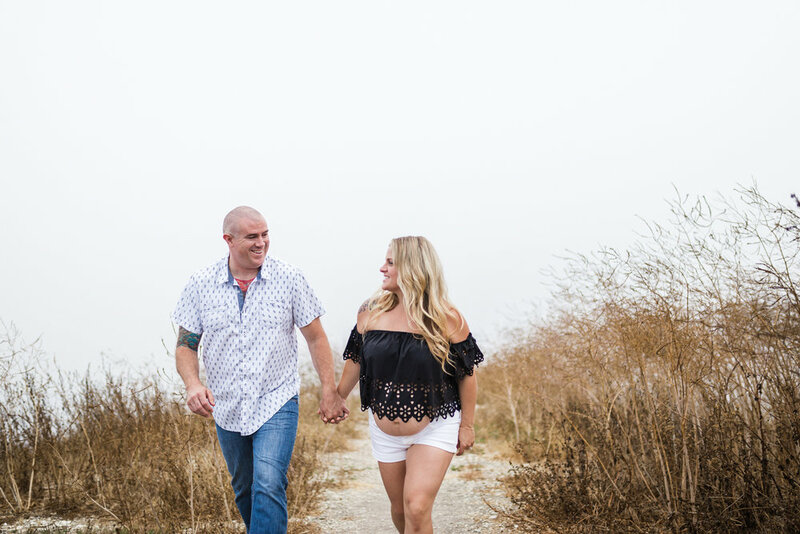 They opted to focus on their relationship for these photos and my goodness- they are such a fun couple! I have so many photos of them smiling and laughing and it's really the best. And Kellie is one gorgeous mama. I love that she wore shorts and crop top- it was a nice change from a gown (which I also love!) The weather ended up being extremely overcast with a heavy fog that rolled in right before our session started. I know it wasn't ideal because we couldn't see the ocean, but I love the different feel the fog brings and the drama of it. Their little one is going to be so loved it's ridiculous. They'll be surrounded by lots of laughter, love, and good times. I wouldn't expect anything different from Kellie and Ron. I can't wait to hear that baby has arrived and I look forward to all the Facebook posts as they grow up. Congratulations to you two and to your family!